Bachelor’s Button was designed in 1892, one of the last wallpaper designs by William Morris. This wallpaper consists of a series of cornflowers with acanthus leaves. Bachelor’s button was a common name for cornflowers as they were typically worn by young men in love. Bachelor’s button could be printed in a variety of colours, however it was most popular as a monotone, with the pattern being printed in a light cream colour on a darker background, such as navy blue or teal. This yellowy/orange tone was quite unusual. This wallpaper is one of the few original wallpapers left in the house. 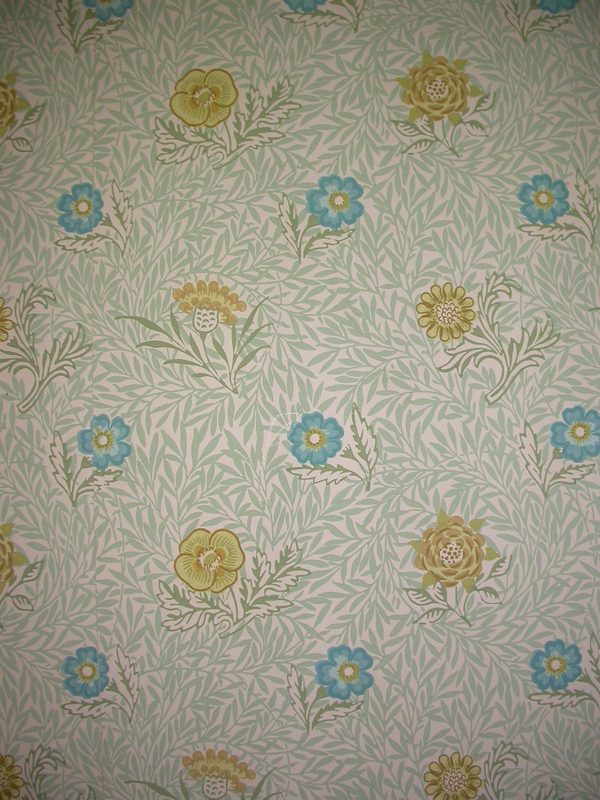 Most of the wallpapers were replaced in the 1960 due to fading and general deterioration but were as closely matched to the originals as possible. The reason Bachelor’s Button was left untouched was because Margaret Beale had it varnished in 1906. 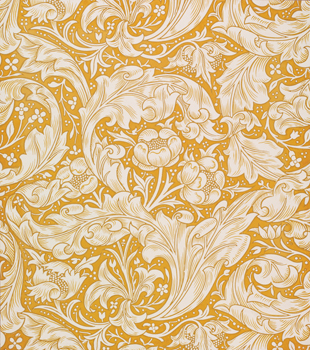 By this point her children were having their own children and Margaret wanted to protect the wallpaper from as much damage as possible from sticky little fingers … This is also why its colour is remarkably unfaded – the colour you see today is very much the colour the Beales’ would have seen. The reason that a lot of the volunteers disliked this wallpaper was because of its colour and that it was fairly garish and overwhelming. The second least liked wallpaper was Powdered. This is interesting in that it was also picked as the most liked wallpaper and a couple of weeks ago. Also the opposite reasons were chosen as to why people did not like it as they felt it was too regimented and boring – it does not look natural. Categories: Uncategorized | Tags: Arts & Crafts, Bachelor's Button, Beale, cleaning, collection, conservation, cornflowers, dull, Historic house, House Team, Orange, Powdered, Standen, Wallpaper, William Morris, Yellow | Permalink.